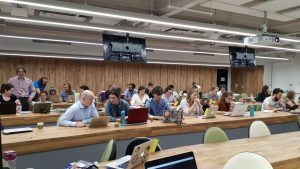 Organised in collaboration with the UK Polar Network and the Centre for Polar Observation and Modelling (CPOM) UCL, more than 20 early career polar scientists were given the opportunity to improve their software skills during an interactive workshop. As with many scientific disciplines within polar sciences we have our software heroes with the opensouce code stored in github… and we have those who would never dream of sharing their code. There are, however, many who would like to fit into the first category and to be more open but are concerned about sharing their code. It was this group that we aimed to help, as well as those who would like to learn better practices in writing and developing their software. 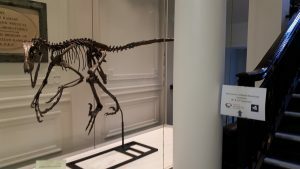 The UCL Earth Sciences deinonychus ready to welcome participants to the workshop. Several SSI fellows provided invaluable help on the day, not only through delivering their own sessions but also staying around and helping participants through the other practical sessions. Adam Jackson kicked off the day with an introduction to open science and sustainable software, and David Perez-Suarez and Yo Yehudi ran hugely successful workshops on testing and open scientific code through github respectively. SSI Fellow Adam Jackson kicks off the day with an introduction to open science and sustainable software. 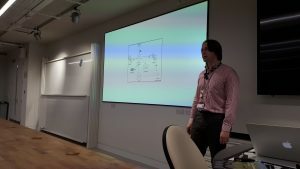 In addition to this training we had two speakers from industry who demonstrated that their software skills have transferred to careers outside of academia: Ruari Rhodes (Hiscox) spoke to us and Sam Thomas (Zopa) shared some of his wisdom from his previous work in academia. We were also fortunate enough to have an interlude from the coding from UCL’s Professor Chris Rapley who shared his extensive knowledge on climate change communication, setting us up nicely for the following day’s hackday. Workshop particpants get to grip with David Perez-Suarez’s testing session. 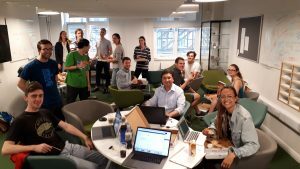 The UK’s First Polar Hackathon? Following the training workshop, many of the participants returned to participate in (as far as we are aware!) the UK’s first polar science hackathon. We were joined by participants from Airbus and other departments from UCL (physics and geography) to work on a variety of problems, including machine learning, shipping routes through the Arctic and extreme events in Greenland. Projects were judged by popular vote, with a focus on open science, collaboration within the team, as well as results found during the day. Prizes for the hackathon were generously provided by Indorse. A welcome pizza break from coding during the hackathon. We will share results of this workshop with the international earth sciences community at December’s American Geophysical Union Fall Meeting. We would like to thank the Software Sustainability Institute for providing funding for this workshop through my fellowship fund as well as the Association for Early Career Polar Scientists for additional travel support and endorse for sponsoring our Hackday. This entry was posted in Blog, Latest news, Uncategorized by admin. Bookmark the permalink.